I have spent quite a bit of time looking for perfect bike panniers with STYLE. I have definitely found them in the Arkel Commuter Pannier and Arkel Messenger Briefcase. My Arkel panniers are beautifully color coordinated with my bike! That’s me arriving home with my Arkel Panniers on the right, and that’s the Arkel Messenger Briefcase stuffed full of my stuff further down below in this post. It’s amazing how much stuff I manage to put in it! 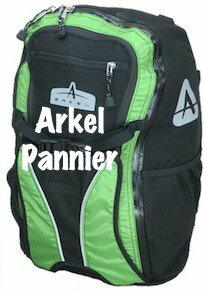 You can purchase Arkel Bike Bags direct from Arkel here. After buying my Emotion 650 Street (reviewed here) I decided to become more of a stylish cyclist, rather than being kitted out for utility. I had purchased some waterproof bike panniers which worked but they were decidedly UGLY. Not only that, but they were the cycling equivalent of throwing all your gear into a large plastic garbage bag. This meant that everything tumbled around as I rode and then I fumbled around in the chaos for keys and wallet. There was often condensation, making everything a damp, smelly mess. I began an online quest for the perfect bike panniers with style. I found a Canadian company called Arkel, based in Quebec. Their website has an extremely useful essay called “Choosing the right bike pannier”. Not only is it great information, but it tells me that these people take panniers very seriously … and their bike panniers are beautiful. 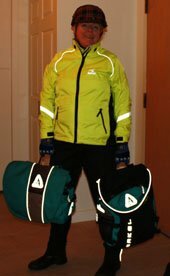 The essay explains the difference between water resistant and waterproof, which exactly described my experience with my previous panniers. It’s AMAZING how much stuff I can put into my Arkel Pannier! Basically, if you have a 100% waterproof bike pannier, what you have is a rubber bag that will accumulate moisture. They are usually just large containers too, so you cannot find anything in them. And while you’re searching, rain could be pouring in and turning your waterproof pannier into a portable swimming pool. That’s why most panniers are deliberately NOT 100% waterproof. I selected two teal green ones – an Arkel Messenger Briefcase and an Arkel Commuter Pannier (as shown above, except sadly the Arkel Commuter no longer comes in teal). I mount both bike panniers on my rear rack. Because I am a super organized commuter I tend to use two bike panniers only at the beginning of each week when I am lugging in a few changes of clothes and food for my lunches. The rest of the week, I prefer to travel with only one bike pannier if possible. What I like about this set is that I can designate my Arkel Messenger Briefcase mainly for work and the Arkel Commuter Pannier for my pleasure rides. The Arkel Messenger Briefcase is so good looking that I also use it on days that I am not riding my bike. The Arkel Commuter Pannier fits up to a 17” laptop in a separate compartment with padding and extra rigidity for protection. The pannier has many useful compartments to keep your keys, wallet, glasses, etc. all organized. There is also an external compartment for your water bottle. This bike pannier is mainly waterproof. The Arkel Messenger Briefcase fits up to a 15” laptop in a separate compartment with padding and extra rigidity, and also has four separate pouches on the inside of the side wall to keep your belongings organized. The capacity of the bag is good: I can travel easily with my files and laptop. The Arkel Messenger Briefcase also has a handy pocket on the front cover to toss your keys in at the last minute. The color is gorgeous, but unfortunately it seems that the Arkel Commuter is no longer available in teal. I have never seen such pretty bike panniers that are tough, rain resistant, and stain resistant. You can order waterproof rain covers for extra security in the rainiest times of the year – I have not needed them yet. The rack hooks and bungie cord tuck away so that they don’t catch on your clothing when carrying the bags. The bike pannier handles have protective neoprene or soft plastic covers over the nylon cords. Those nylon cords can be really hard on the hands if your load is heavy. I really appreciate this concern for comfort. Both panniers have plenty of reflective points for night travel. The Arkel Commuter pannier also has a shoulder strap which makes it more convenient for short trips. This is a feature I have never seen in any other panniers that I have owned. I have just purchased rain covers for both panniers, which are sold separately. They are bright yellow, which I like for rainy cycling conditions. The handy pocket on the front of the Arkel Messenger Briefcase should have a zipper. While the pocket is handy, everything falls out every time you open the bag. The interior pockets on the Arkel Messenger Briefcase are a bit large and cavernous. I would prefer a mix of deep and shallow pockets which would help to keep pens and iPhone handy. It would be great to have a space inside the Arkel Messenger Briefcase to securely hold a water bottle. It would also be very nice to have an interior loop or hook to keep your keys handy whether the Arkel Messenger Briefcase or Arkel Commuter is open or closed. The bottom line is that the Arkel panniers are the best panniers I have ever owned. They meet my needs for style, functionality, and durability. They definitely rate an Average Joe Cyclist Gold Bike Award! You may also like to read Average Joe Cyclist’s review of his Arkel Bug Pannier (this one can be handily converted into a backpack in a matter of seconds). He uses it all the time, for work, recreation, and vacations.